Located adjacent to Sherbrooke Forest in the Dandenong Ranges outside Melbourne is the well known 22.5 hectare property, Burnham Beeches. This magnificent Art Deco mansion, known as the Norris building, was designed by Harry Norris and built in 1933 for the Nicholas family. A rare, elaborate example of its type in Australia, it is comparable with works in Britain and the United States The vast three storey house is built in reinforced concrete and surrounded by significant gardens containing a mix of indigenous and exotic plantings designed by Hugh Linaker. The original concept, with substantial outbuildings, was a self-sustaining estate. Architect Harry Norris was a prominent Melbourne Architect at the time who designed many iconic buildings. The property is classified by the National Trust and is Heritage listed. By 1965 a large proportion of the landscaped gardens became too difficult to maintain, so the lake along with 32 acres of garden was donated to the Shire of Sherbrooke (now the Yarra Ranges Shire Council) and named the Alfred Nicholas Memorial Gardens, open to the public. Three acres at the front of the property became a miniature village in the early 1970s and has since been transferred to Parks Victoria. Celebrity chef Shannon Bennett and developer Adam Garrison now own the property and have applied to redevelop the estate, hoping to bring it back to its original purpose and to become a tourist attraction. The proposed removal of about 13 beech trees at the entrance met with local protests and have recently been saved, with approval being given for the development of the site but not the removal of the trees. Plans include the restoration of the Norris building to become a six-star hotel and the addition of a microbrewery, shop and new restaurant inside the existing Piggery Cafe. The decorative mouldings that create a handsome and sleek finish to the art deco style in the Norris building were originally made of concrete. These days the Finishing Touch can supply art deco decorative mouldings in a lightweight material that is easy to transport and install, making it a very viable option for a modern build, capturing the elegance of the art deco period. 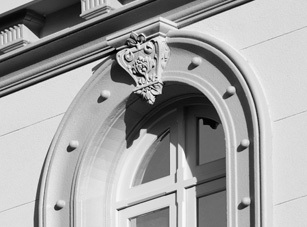 The use of decorative architectural mouldings on a building help create a specific look, whether it be French Provincial, Edwardian, Georgian, Mediterranean, Tuscan, Art Deco or Modern. Light weight, easy to apply mouldings marketed by the Finishing Touch come in a range of shapes, styles and sizes. Arches are a popular choice and create a stunning effect on a building. They are hand made and designed to follow the existing arch lines on the building, they can be made in almost any profile desired. The look is usually topped off by a keystone on the arch. 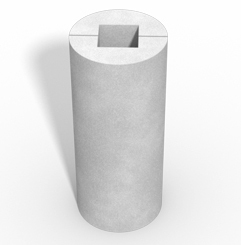 Columns are another popular choice and help create the look of the building, They are available in square, round, fluted and tapered shapes. 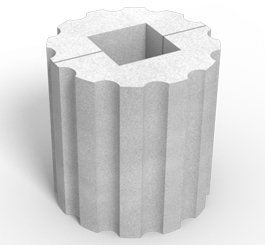 The columns are made in two halves to wrap around steel or timber posts and come in a variety of sizes to fit columns from 200mm to 450mm. Window decorations are mouldings that are ever in demand. Window architrave mouldings are used to decorate and highlight around windows, door entrances and garages. They come in a variety of designs and styles and some are even designed to suit aluminium windows. Although the mouldings are manufactured in standard lengths up to 3400mm they can be cut to suit specific window sizes to avoid wasted off cuts. Window Headers sit on top of a window, enhancing and augmenting its look. 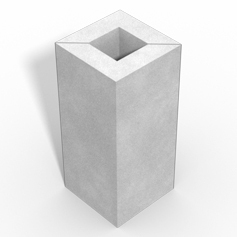 There are two designs to choose from and moulds are shipped in a standard length of 2.4m. Any custom length can be ordered, however with a maximum length of 3.4 metres. Mouldings can also be custom made to order. For a free onsite consultation on the use of mouldings to suit your building design contact the Finishing Touch on 03 9762 1676.